Our team of in-house foundation contractors can get your home back on solid ground! Call us for a free foundation repair quote today! We serve Minneapolis, Superior, Duluth, and many nearby areas in Minnesota and Wisconsin. As a locally owned and operated foundation repair company, we understand the ways that soils in Minnesota and Wisconsin affect the homes they surround. Our team of in-house foundation contractors is ready to meet with you to explain what's happening with your foundation -- and how to fix it. 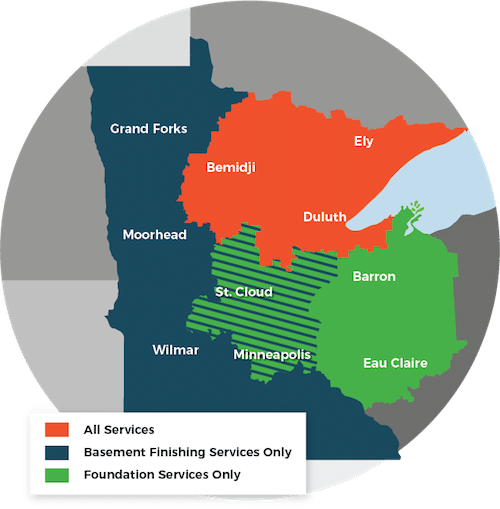 We proudly serve Minneapolis, Superior, Duluth, nearby areas such as Cloquet, Two Harbors, Hermantown, St. Paul, Esko, Virginia, Ashland, and the surrounding areas of MN and WI.